The Edition C sedans under Mercedes-Benz India's portfolio will be featured across the C200, C220d and C250d Avantgarde sedans. 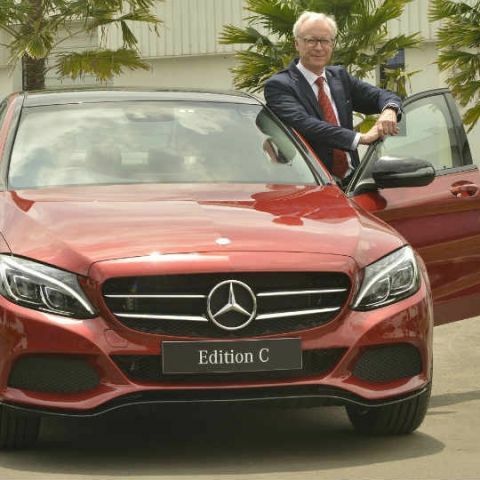 Mercedes-Benz India has unveiled a new C-Class Edition C trim, available exclusively to the Avantgarde models of its C-Class sedans. The new trim is not a major upgrade in terms of the features and performance specifications, and focuses mostly on aesthetics. The Edition C trim will be available to the Mercedes-Benz C200, C220d and C250d Avantgarde sedans, and each of them now have an additional external paint available exclusively to the Edition C trim - Designo Hyacinth Red, the same colour that was introduced to the GLC 'Celebration Edition' SUV earlier this year. In terms of upgrades, the Garmin Map Pilot SD card-based navigation system has now been made standard across all the three Edition C sedans' infotainment systems. The pedals have been given a sporty makeover, with rubber embossing on stainless steel pads. The dash also gets a new veneer trim - open pore black ash wood. On the exterior, the front spoiler lip and the rear spoiler are painted black for a sportier appeal. The alloy wheels are now five twin-spoke ones with high-gloss, high sheen black finish. The front ventilation openings, side skirts, mirror housings and the beltlines of the sedans have also been painted black, in what Mercedes calls the 'Night Package' of the Edition C trim. The final change are to the bottom of the ORVMs, which get LED projector lamps that will project the Mercedes-Benz logo to the ground when you unlock the door.